KTCUs The Good Show brings in a larger audience and local flavor thanks to shows time change. 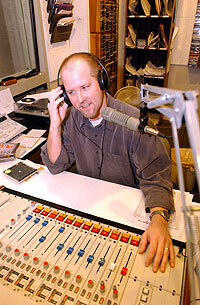 More listeners are turning into KTCUs, The Good Show now that it has moved to Sunday nights. Hosts Tom Urquhart and Chris Bellomy switched from their Saturday morning slot to attract more local artists and a bigger audience. TCU graduate Tom Urquhart hosts his specialty show, The Good Show, Sunday night in the KTCU on-air studio in Moudy Building South. Provost candidate Michael Mezey highlighted the importance of the universitys commitment to the liberal arts, citizenship and leadership in an open forum for faculty and staff Monday. The entrepreneurs at the Ryffel Center have invented a way to recruit students during TCU Young Entrepreneur Days. Imagine youre sitting in your afternoon class on the north side of campus and youre starving. This, as many of you know, is not a good combination. Despite obvious demand, there is still no food service on this part of campus. Who knows how the invitation will look. Will it be printed in gold on paper so lavish it is used by the Trumps? Will it have an RSVP requesting a number of guests? Will it be received via a phone call, or an e-mail from the commissioner?